These motors only fit the rock tumblers listed below. 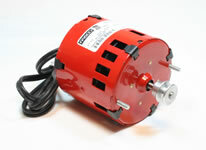 If you need a motor for another tumbler or some other project visit Grainger.com. 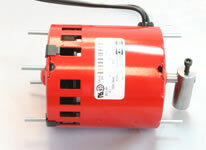 We sell replacement motors for the most popular tumblers manufactured by Lortone and Thumler's Tumblers. 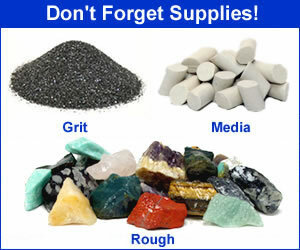 They are easy to replace with no special tools required. If you have a screwdriver, small wrench, wire cutters and a knife you can install any of these motors. Please do not purchase these motors for other types of tumblers - get information for other tumblers here. This is the small light duty motor that fits Thumler's MP-1 and Model T-1 Tumblers. It comes with the motor, pulley and power cord. 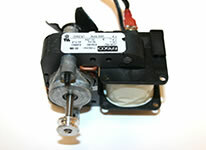 This overload protected motor fits all Thumlers AR series tumblers and will automatically shut off under excessive load. 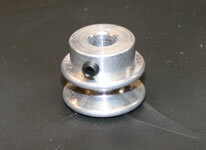 Here is a list of the tumblers this motor fits A-R1, A-R2, A-R6 and A-R12. This motor does not fit other tumblers. This is the low speed (1550 rpm) replacement motor designed for rock tumbling in Thumlers Model B rock tumbler. It is an overload protected motor that will shut off automatically when under excessive load. Easy to replace, just remove the belt, mounting screws and replace. This motor does not fit other tumblers. This is the high speed (3000 rpm) replacement motor designed for brass tumbling in Thumlers Model B tumbler. It is an overload protected motor that will shut off automatically when under excessive load. 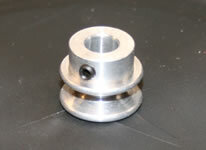 Easy to replace, just remove the belt, mounting screws and replace. This motor does not fit other tumblers. This is a replacement motor for Thumler's UV-10 Mini Bowl vibratory rock tumbler. 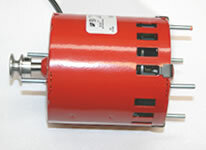 The motor is thermally protected and has a counter weight on the shaft behind the fan to create the vibrations during operation. 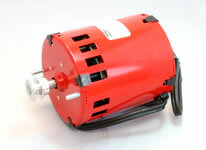 This replacement motor fits Thumlers industrial UV-10 vibratory rock tumbler. It is overload protected and will shut off automatically when under excessive load. This motor does not fit other tumblers. Motors for the Lortone tumblers generally last a very long time - running many years without needing replacement. But, if you tumble a lot you might need a new motor. They are easy to replace if you know how to use crimp connectors to splice wire. This motor fits the Lortone Model 3A, 33B and 45C. This motor does not fit other tumblers. 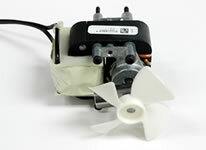 Lortone QT motors are easy to replace. Just open the case, remove the belt guard, remove the belt, remove the two motor-mounting screws, replace the motor, replace the screws, replace the belt, replace the guard and close the case. Congratulations! This motor fits the Lortone Model QT6, QT66 and QT12 tumblers. This motor does not fit other tumblers. 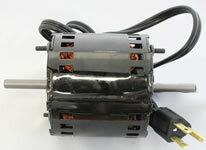 A replacement motor for the Lot-O-Tumbler Single or Twin. The motor fans that contain the counter weight are NOT included. This motor does not fit other tumblers.